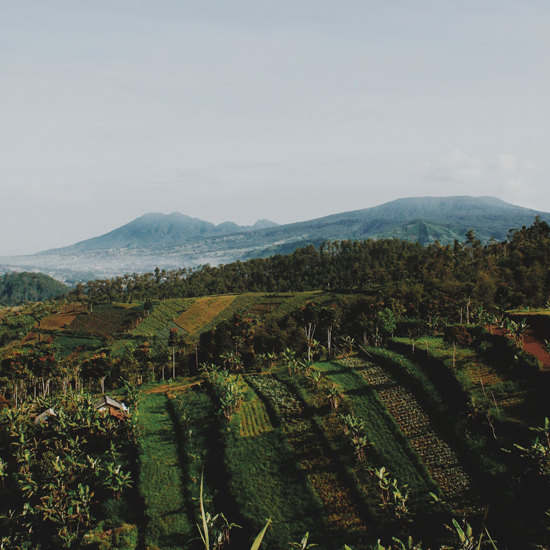 Photographer and Instagram star Putri Anindya captures the breathtaking capital of Indonesia’s West Java province, Bandung. 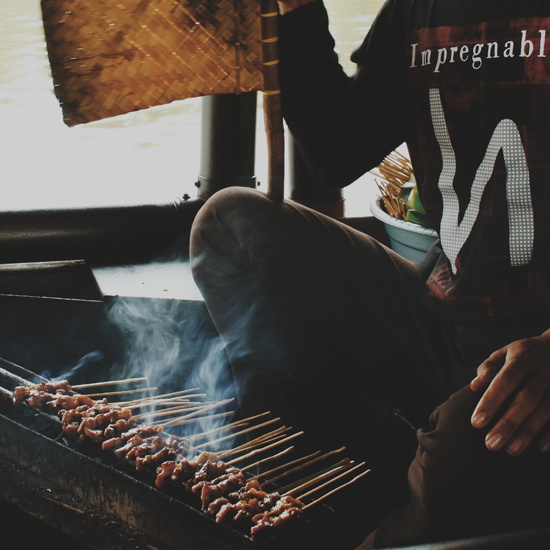 Surrounded by hills and mountains, the city is rich in culinary history and attracts food tourists from nearby Jakarta. 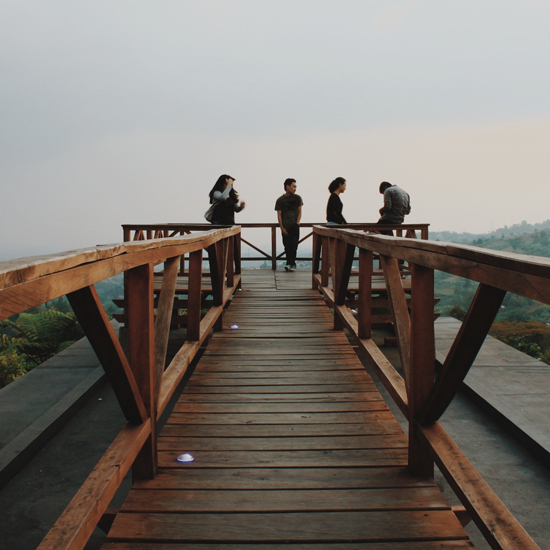 Bandung Photo Tour by Putri Anindya. Follow her on Instagram @puanindya and on VSCO. Read about her Bandung hot list here. 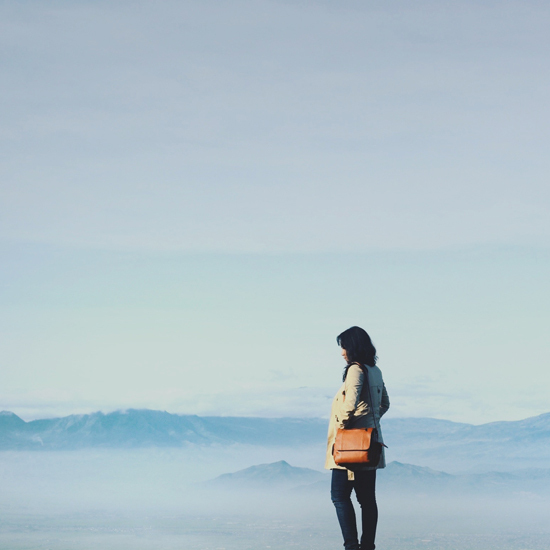 Her tour begins with the beauty of Bandung’s outskirts: a sunrise viewed from the hilltop of a tea plantation. 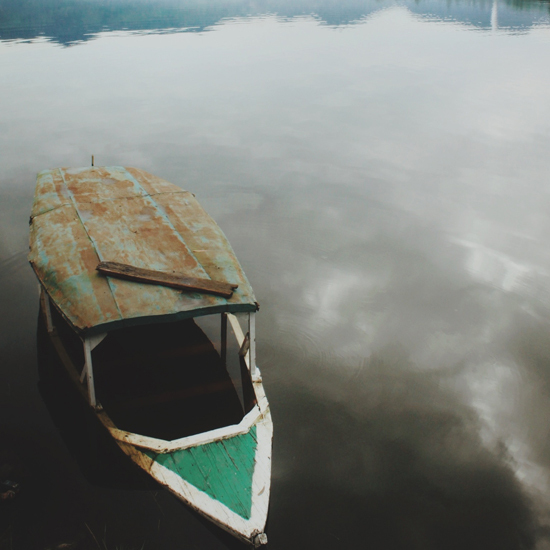 A sinking boat on Cileunca Lake. 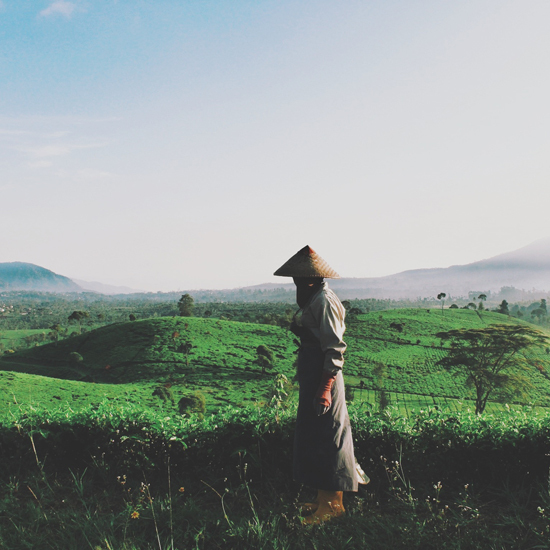 A tea plucker ready to work. 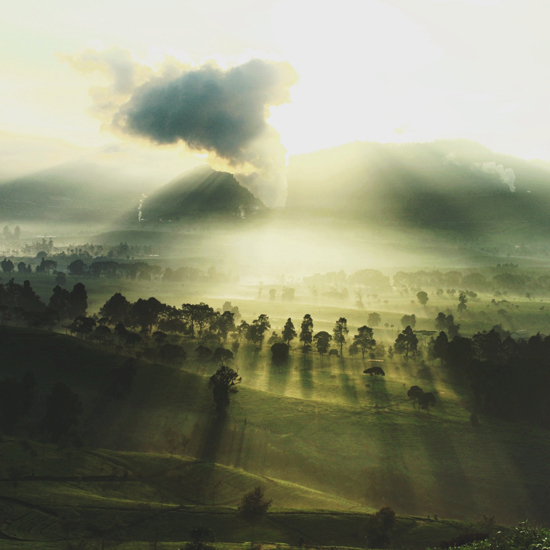 Surrounded by Bandung’s beautiful mountains and fog. 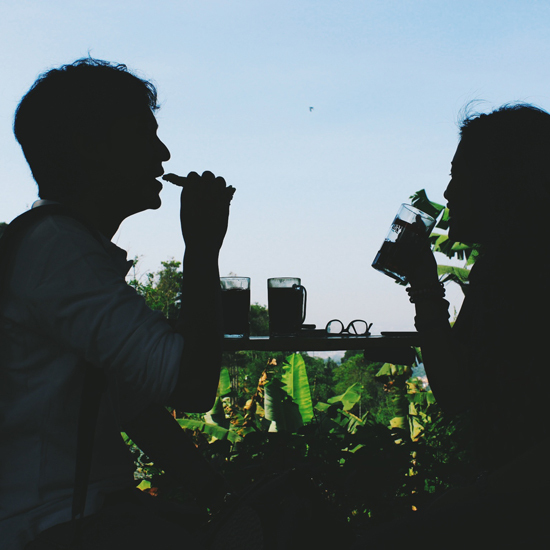 This was taken from Warung Daweung, in Bandung. 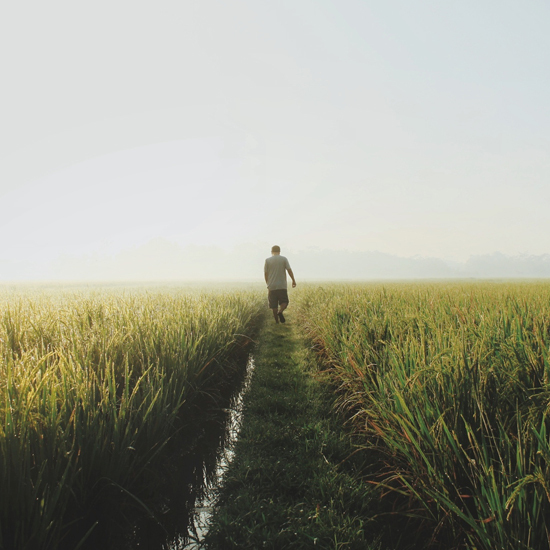 In the middle of rice fields in Bandung. Fried finger foods for breakfast in Bandung (fried banana, fried tofu and fried tempeh). 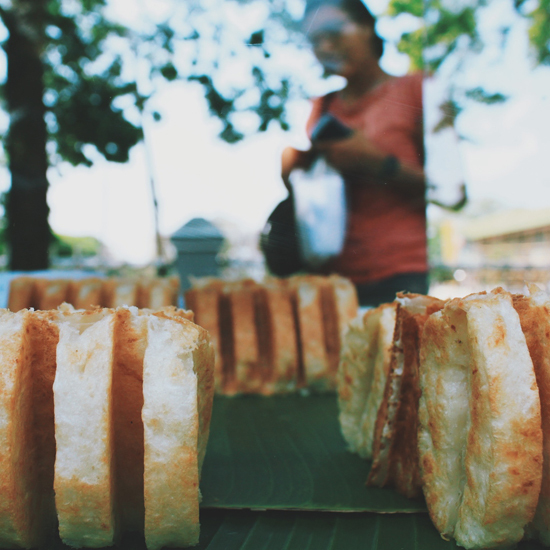 These coconut cakes (pancong) are being sold by a vendor near Saparua Sport Center. 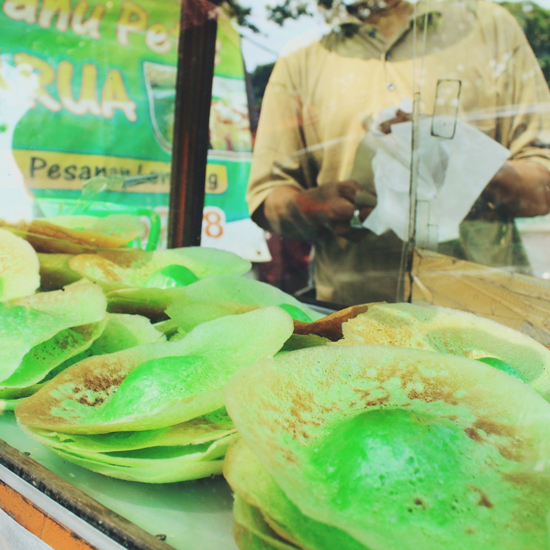 Delicious ape cake (kue ape), a traditional food from Indonesia that is like a flour pancake with crispy edges. 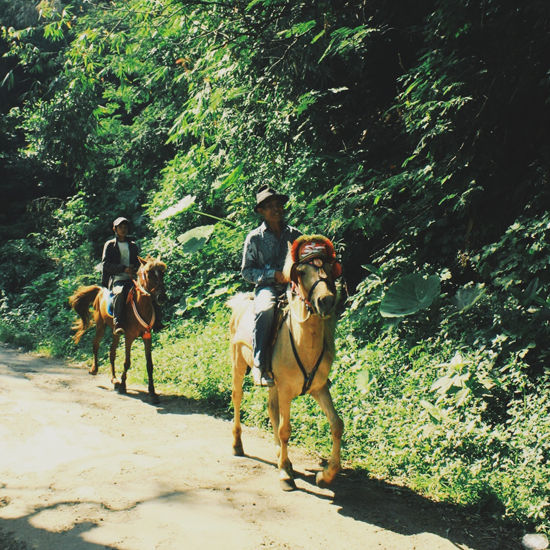 Morning ride in Taman Hutan Raya Djuanda in Bandung. 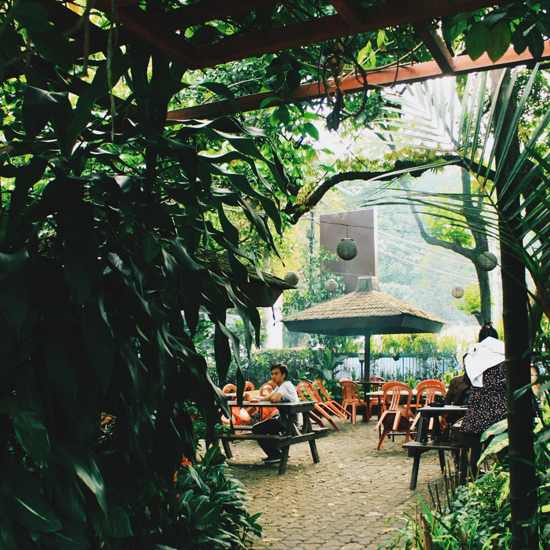 Taman Hutan Raya Djuanda is a city park with many trees. 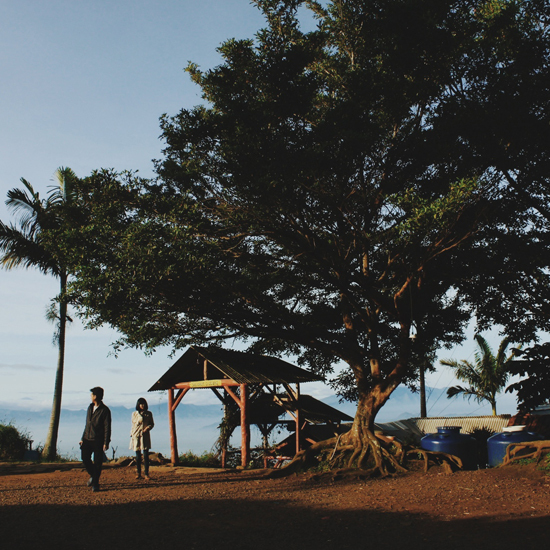 It also features two of historical caves from Dutch and Japanese colonial eras. 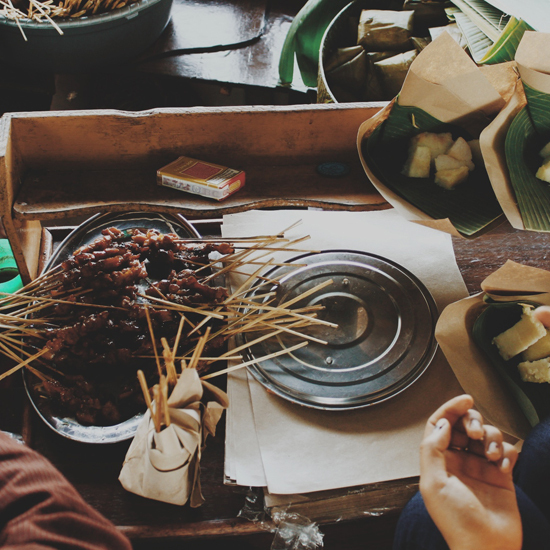 Combro is a traditional street food from West Java, Indonesia. It’s made with cassava and oncom (which is similar to tempeh). 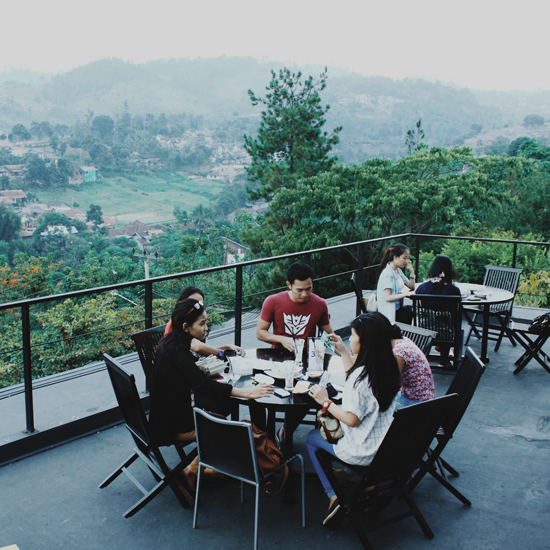 This is a beautiful place to eat in north Bandung called Lawangwangi. It's both a cafe and art space. 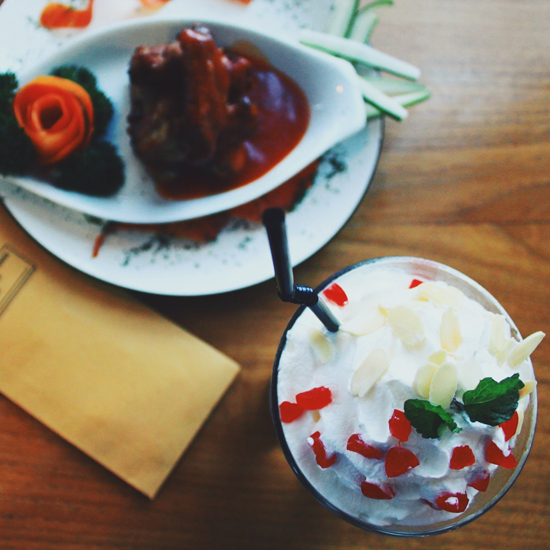 The lovely milk shake and chicken wings at Lawangwangi. 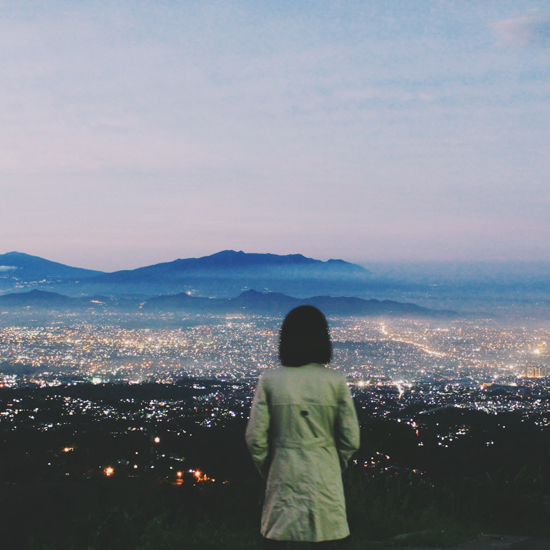 Bandung from above. 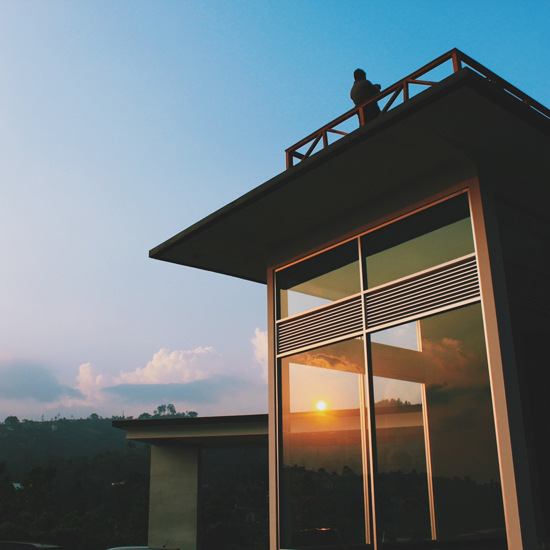 Caringin Tilu is one of the best places to watch the sunrise in Bandung. 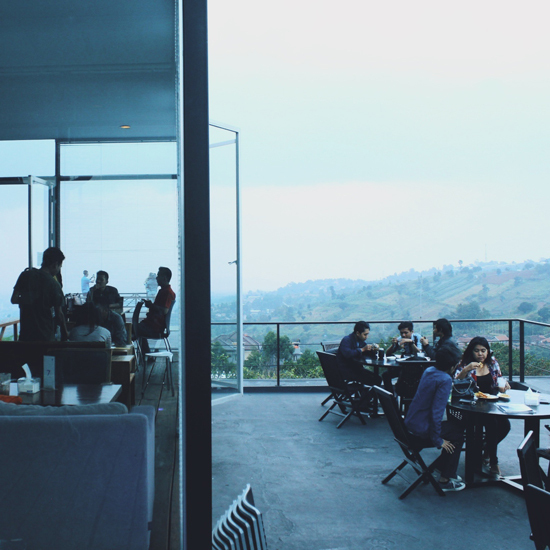 The highest café in Bandung, Warung Daweung. 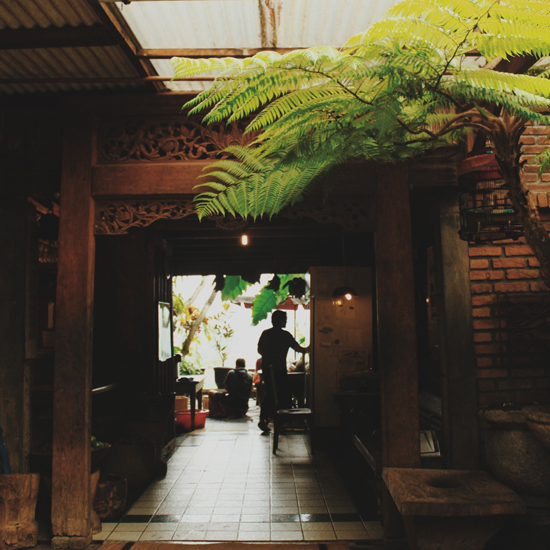 Hanging out at Warung Daweung. 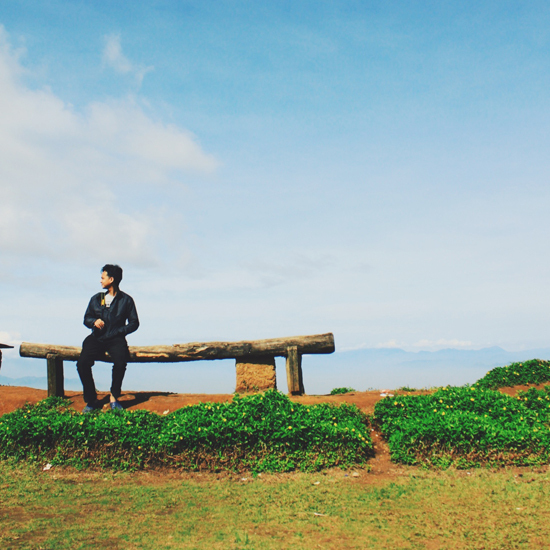 The famous Tangkuban Parahu Mountain in Bandung. 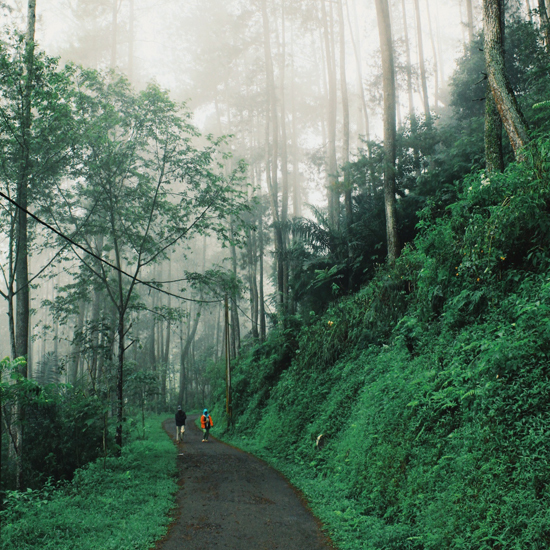 Walking out from the fog in Taman Hutan Raya Djuanda. Gorgeous Indonesian architecture in front of Bandung's famous Warung Lela Noodle House. 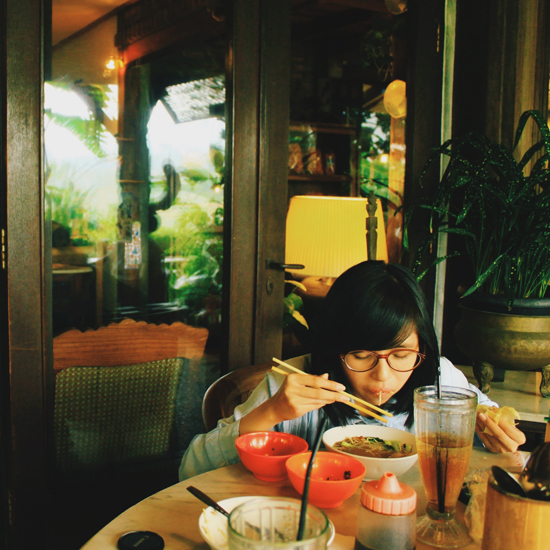 Enjoying the delicious noodles and warm environment at Warung Lela. 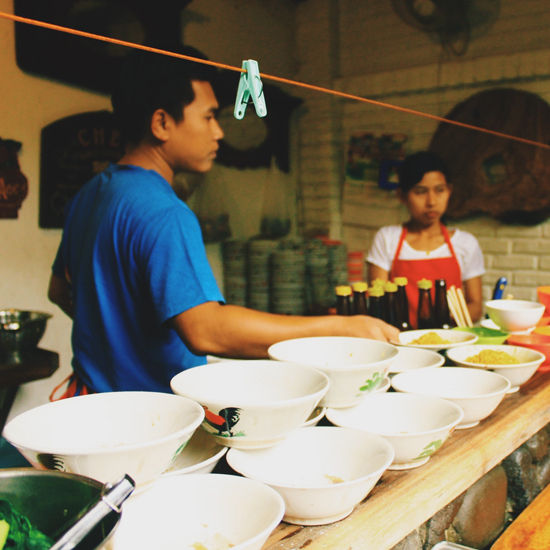 The delicious chicken noodles in Warung Lela. 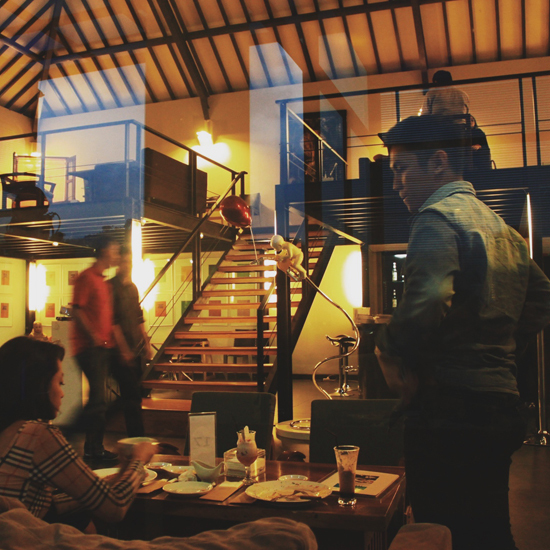 Selasar Sunaryo, a really nice place for drinking delicious coffee in Bandung. Breakfast at Warung Bandrek. Bandrek is a delicious hot drink made with ginger. 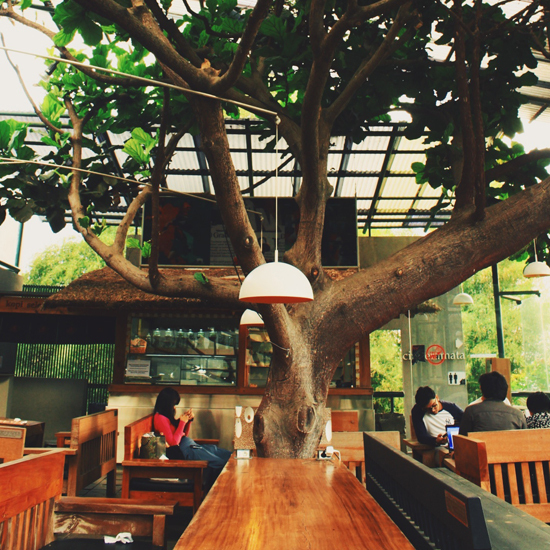 Warung Bandrek has a very high altitude and is hard to get to, but it’s very popular with the bicyclists in Bandung. 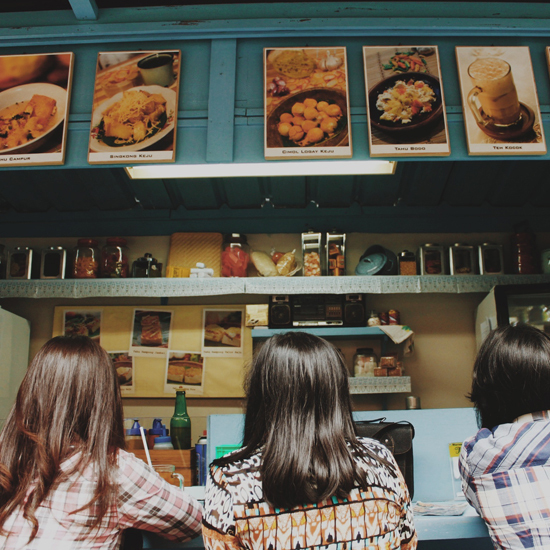 Warung Talaga in Cihampelas Walk, Bandung. This place has a lot of delicious traditional Indonesian foods. 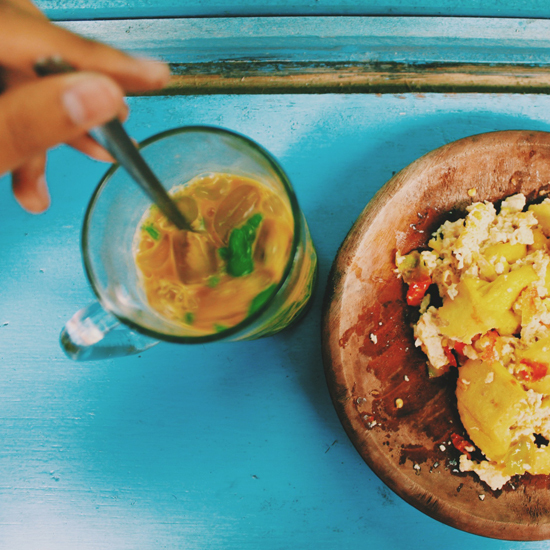 One of Warung Talaga’s specialities, tahu bodo, is fried tofu mixed with very spicy house condiments or sambal. 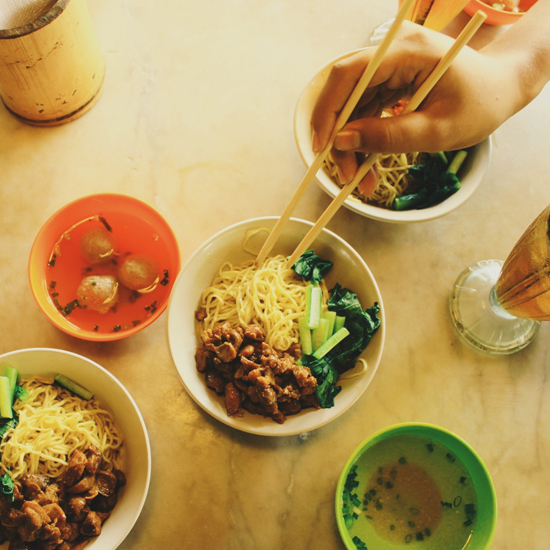 It’s perfect with cendol, a sweet drink of shaved ice, coconut milk and mung bean noodles. 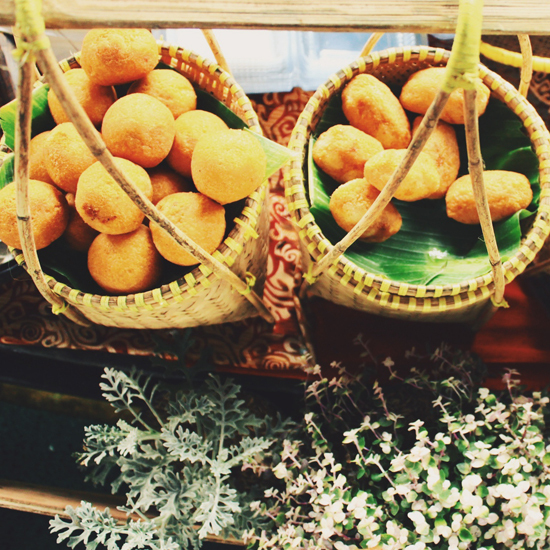 Lembang Floating Market is perfect for visitors because of its beautiful views and delicious food. 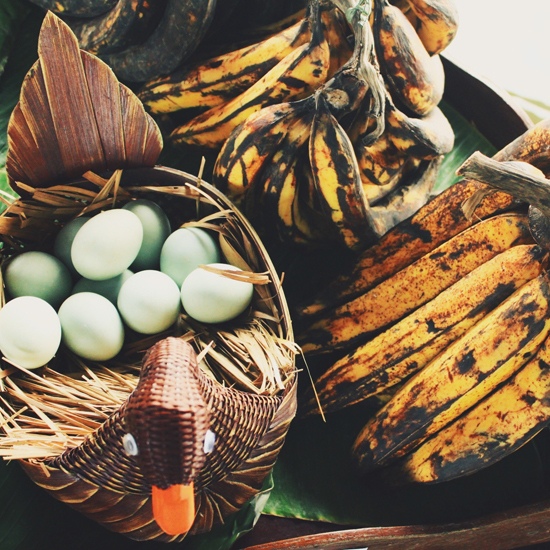 The famous salted eggs and some bananas at the Floating Market in Lembang, Bandung. 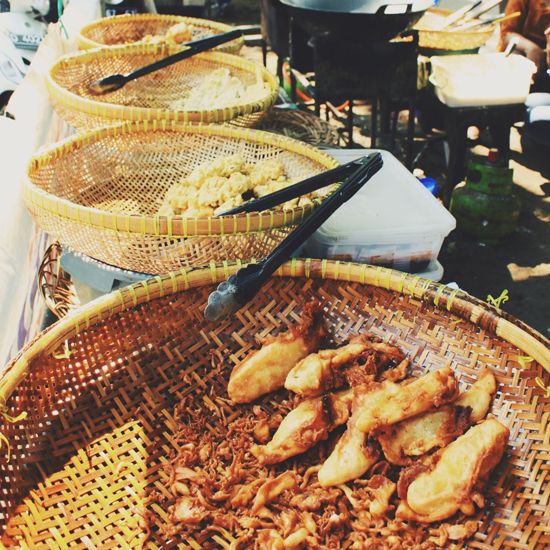 One of the most popular foods in Lembang Floating Market is this chicken satay. Close-up of the Lembang's chicken satay. 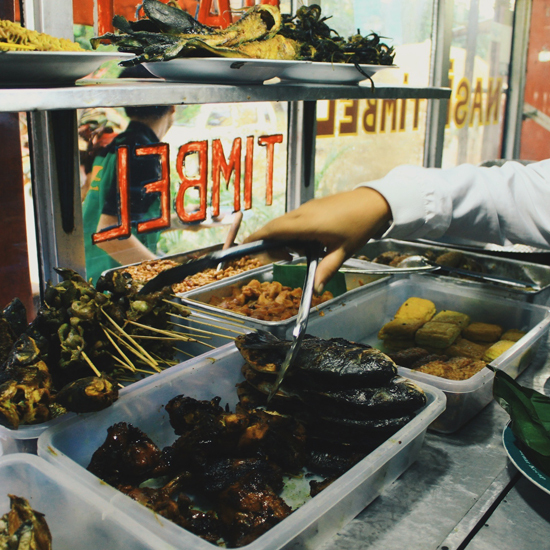 Nasi Timbel Istiqomah is really popular for their delicious rice and grilled chicken. You can choose what you want to eat just like this. 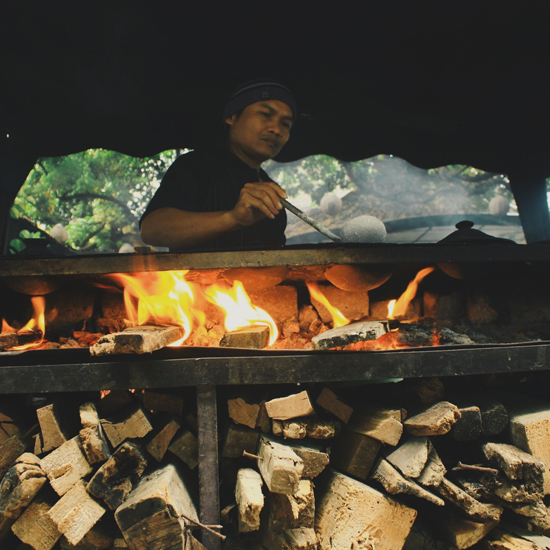 This is a surabi vendor on Cisangkuy Street in Bandung. Surabi is a traditional food with a sweet and salty taste. Cisangkuy specializes in yogurt. It’s so well-known that many Jakarta tourists visit on the weekends. 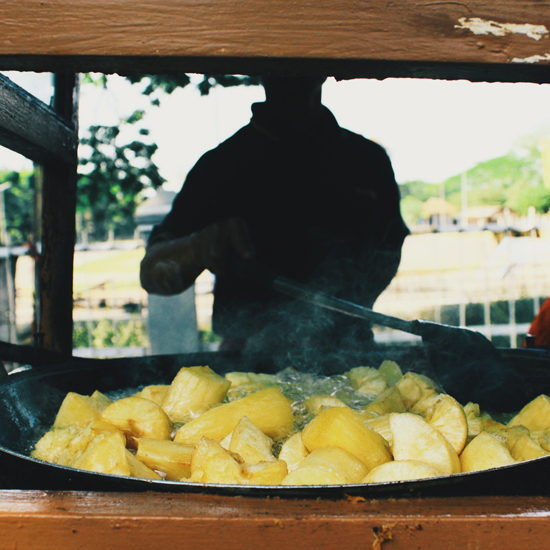 This vendor is making fried cassava in front of Saparua Sport Center in Bandung. 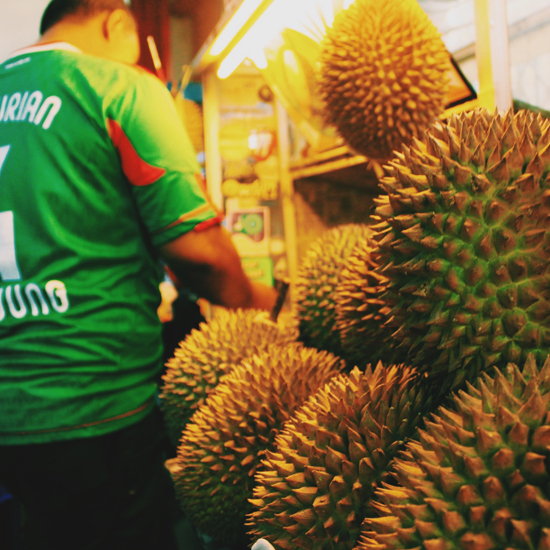 This place sells durian, a tasty fruit from Southeast Asia. 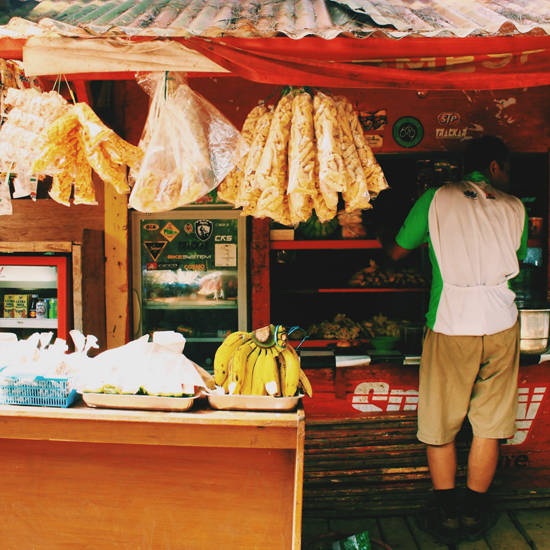 Usually, people here make it into an ice cream or just eat the durian with shaved ice and sweetened condensed milk.